"Following a scalding row with her mother, fifteen-year-old Holly Sykes slams the door on her old life. But Holly is no typical teenage runaway: a sensitive child once contacted by voices she knew only as “the radio people,” Holly is a lightning rod for psychic phenomena. Now, as she wanders deeper into the English countryside, visions and coincidences reorder her reality until they assume the aura of a nightmare brought to life. A Cambridge scholarship boy grooming himself for wealth and influence, a conflicted father who feels alive only while reporting from occupied Iraq, a middle-aged writer mourning his exile from the bestseller list—all have a part to play in this surreal, invisible war on the margins of our world. From the medieval Swiss Alps to the nineteenth-century Australian bush, from a hotel in Shanghai to a Manhattan townhouse in the near future, their stories come together in moments of everyday grace and extraordinary wonder." Arguably the most anticipated novel of the year for me, "The Bone Clocks" fell considerably short of my expectations while having enough goodies to be a very good book and worth reading. After the generally glowing reviews - and for those that were not so, the blame was apportioned on the fact that "respectable" critics hate fantasy and the novel is clearly sff - the high sales in the first week and the very strong first two parts, I was shocked a few days ago when the novel did not make the Booker shortlist, however when finishing it, I kind of agreed it was not the best David Mitchell despite its ambitious scope. 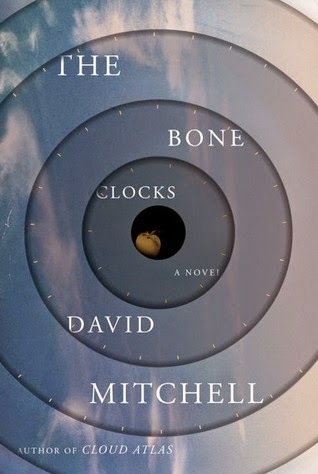 The Bone Clocks features the usual David Mitchell multiple narrator structure advancing in time and in which one narrator takes over from another and the stories connect - mostly directly here - while the author's versatility as a stylist is again on display as the voices rang true and distinct. The fantasy villains are way too one dimensional and the whole Horology vs Cathar conflict, while very promising when mysterious, degenerates into B-grade pulp towards the end. The above 2 flaws would have been tolerable especially with the super-strong parts narrated by 15 year old Holly Sykes and Cambridge student and sharp operator Hugo Lamb, while the third Ed Bruebeck part is ok despite the Iraq post-war reporter stuff being a bit out of place, but choosing to devote the largest part of all - and probably about 1/3 of the book total - to Crispin Hershey's voice and the themes that Howard Jacobson did so well last year in Zoo Time - author as fading celebrity, skewering the publishing industry, self-pity and aimless personal life - just put The Bone Clocks into a nosedive from where the Martinus part and the Horology/Cathar back-story which were extremely fascinating, couldn't rescue it as the contemporary action degraded to pulp super-villains against semi-super-heroes stuff lacking any nuance. Then the last short epilogue/coda like part felt also a bit out of place - emotionally strong and resembling for example the ending of another 2014 major literary sff release - The Book of Strange New Things, but not really fitting with the rest so well. Overall, The Bone Clocks is very ambitious and has enough goodies to be a very good book and worth reading, but not the best David Mitchell - especially if it's not the first novel of the author one reads as the amazing voice versatility is not as astonishing any more - and quite far from the admittedly humongous expectations I had about it. What a well organized review. I have never read this book, but I am also a fantasy writer. So reviews like this are helpful. But..what is a Horology vs Cathar conflict? What defines it? from the blurb: "a cabal of dangerous mystics—and their enemies."